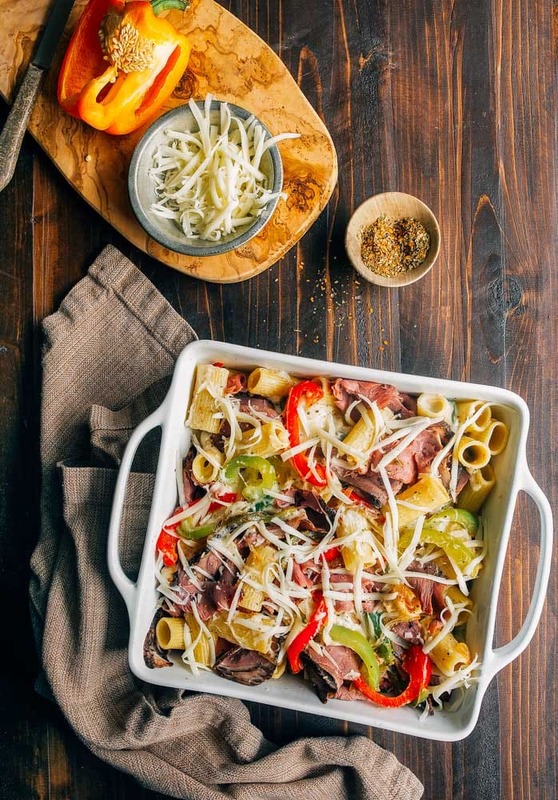 Philly Cheesesteak Pasta: from my pal Lauren Grier’s latest cookbook: Modern Comfort Cooking. It’s Friday! And as promised, I’m here with another Dinner for Two for you! And this one, you guys, it’s killer. Truth be told, I’ve never had a cheesesteak sandwich. I know, I know! I’ve been to the lovely city of Philadelphia several times, spent hours in Reading Terminal Market, eaten dozens of cannoli in traffic, and yet, I haven’t had a proper Philly Cheesesteak Sandwich. It’s more than a little ridiculous. I like the general premise of it: toasted roll, grilled veggies, thin pieces of steak, and cheese. 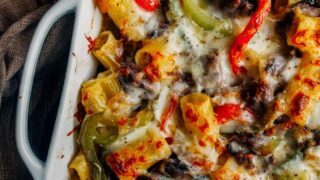 I feel confident that this Philly Cheesesteak Pasta captures the flavors perfectly, and that’s because my sweet friend Lauren Grier of Climbing Grier Mountain developed this recipe. It’s in her new cookbook, Modern Comfort Cooking, and I couldn’t love it harder if I tried. In her book, Lauren actually uses chicken for this dish. I originally planned on that, but while I was shopping for ingredients, I spotted cooked, thinly-sliced London Broil in the prepared food section of my grocery store. It felt like it was meant to be, so I scooped it up. Plus, it eliminates the step of cooking the chicken, so I think you’ll be happy, too! It’s baked pasta, coated in a Provolone cheese sauce, stirred into a delicious mess of seared peppers and onions. I push little pieces of steak into the dish before putting it in the oven for its bake. 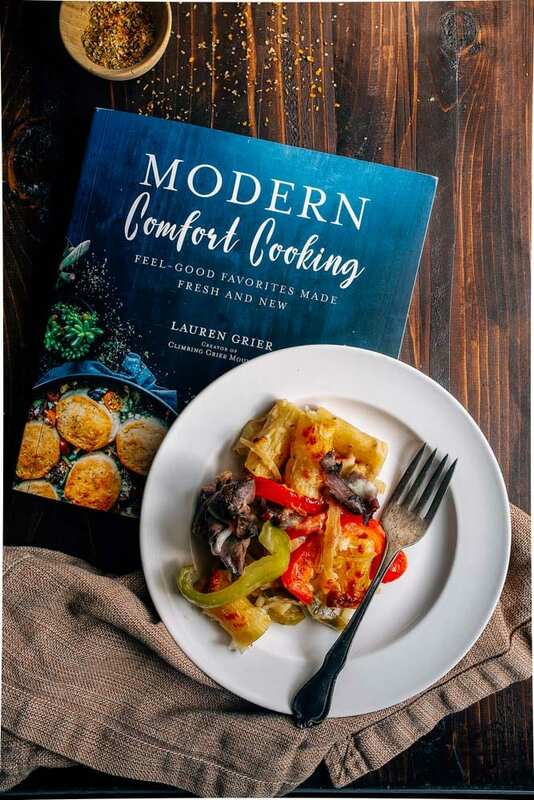 A few more reasons you need Lauren’s book…she’s a wizard in the kitchen that combines your favorite comfort foods into a mash-up that is even more comforting and even more delicious! The flavors of a Philly Cheesesteak in a pasta dish is just one example, but her Chicken Pot Pie Poutine, Cajun Baked Spaghetti, and Chicken Parmesan Crepes are also calling my name. It’s such a fun cookbook! When your two favorite foods are smashed together (like, say, falafel and waffles), it just makes you want to jump in the kitchen and cook! I scaled Lauren’s recipe down to make an 8-inch square dish of baked pasta for two, so know that you can absolutely double it and serve a crowd if you want. 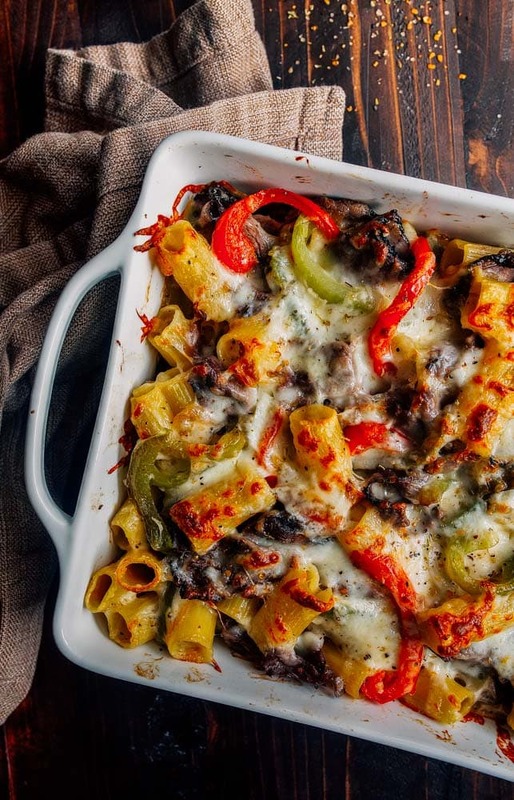 Philly Cheesesteak Pasta bake for two. Preheat the oven to 400. Spray an 8" square pan lightly with cooking spray. Fill a large pot with water and bring it to a boil. Cook the pasta 1-2 minutes shy of the recommended cooking time on the package. Drain and set aside. Meanwhile, in a large skillet over medium-high heat, add the oil. Once hot, add the onion and peppers. Cook the onion and peppers until softened and golden brown (about 10 minutes, stirring occasionally. Lower the heat if they threaten to burn (or add a splash of water). Add the cooked onions and peppers to a large bowl, and stir in the Italian seasoning and red wine vinegar. Add the pasta to the bowl and set aside. Finally, make the cheese sauce: in the same pot you cooked the pasta in, add the butter and melt over medium heat. Whisk in the flour and cook for 1 minute. Add the milk and cook until the mixture is thick and coats the back of a spoon (about 3-4 minutes). Stir the cheese into the pot, and remove from the heat. Pour the pasta and peppers mixture into the prepared pan. Top with the cheese sauce. Tear off little pieces of the steak and stick it into the pasta mixture in the pan. Bake for 10-15 minutes, until golden brown and bubbly. Well, I HAVE had a Philly cheesesteak sandwich and this looks about a million times better. The operation was impressively efficient but the sandwich – meh. hey girl- this looks amazing! right upmy alley! Looks good but I can’t eat cheese! I love the idea of cooking for two- but in my case both of the two would be me and I can’t eat cheese. I would love some savoury suggestions sans lactose. I would really like a recipe for a small batch of savoury breakfast muffins…something really spicy in the way of a vegtetable Indian “something” but without all the oil. I’ve been playing around with this for some time but have not yet made anything I cared to repeat. I appeal to you now!!! I made this last night and it turned out great! We had a little leftover which she took to work for lunch. Her co-workers were jealous!